The Part Time Gourmet: Coarse Salt...Grey Salt...Table Salt...? Kathleen Purvis is asked what the difference is between coarse and grey salt. If you watch cooking shows, especially Michael Chiarello, you've heard them refer to Grey Salt. If you're confused about the difference between the types of salt, these paragraphs may prove helpful. Coarse salt usually refers to kosher salt. It has larger grains than table salt. It's often used in brining (soaking food in salt water) because it dissolves easily. Kosher salt also doesn't contain iodine. Iodine has been added to table salt since the 1920s, for thyroid health. Today, gourmet stores also sell sea salts from around the world. Sel gris, or grey salt, is sea salt from Brittany. 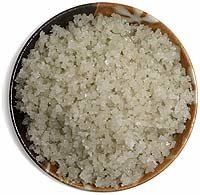 French fleur del sel, literally "flower of the sea," is a salt that blooms on sea water. Whether these salts have a different taste is debatable. But one thing they offer is texture. Sea salts usually come in flakes. Chefs use them as finishing salts, sprinkling them over food just before it's served to add crisp texture and bursts of salt flavor. You wouldn't want to cook with sea salt. It's expensive -- some cost as much as $21 for a package -- and it loses that flaky texture when it dissolves.